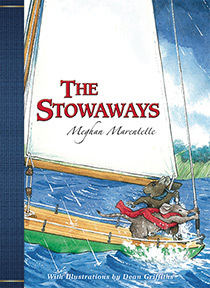 I’ve been shortlisted for the Canadian Library Association’s Book of the Year for Children Award, for The Stowaways!!! This is my first novel, so I never expected anything like this to happen. I looked back over the list of past authors who’ve won since 1947 and was excited to see Dennis Lee and Mordecai Richler on the list — they won for three of my all time favourite children’s books: Garbage Delight, Alligator Pie, and Jacob Two-Two Meets The Hooded Fang — books that I read over and over and over again when I was a wee little girl. I am honoured, to say the least!! Congratulations on the nomination! Lisa Doucet has high praise for your book and I’m looking forward to reading it. Thanks for visiting my post on L.M. Montgomery and Point Pleasant — I’m glad you enjoyed it. Thanks, Sarah! Your post about LM Montgomery was really interesting. I’ve thought negatively about Halifax many times as she did – but that walk through PPPark also seems to heal me… 100 years later. When I first moved to Halifax at the age of seven, I found that trips to Point Pleasant made my homesickness worse, because I was missing the prairies and seeing the ocean reminded me of how different my new home was. But after many years, I’ve grown to love Halifax, and if I lived anywhere other than here, I’d miss Point Pleasant. Maybe I’ll take your book to the park and read it there (when the weather’s a little warmer).